Norm Schulman’s work ranges from the purely functional to the purely sculptural. "Norm Schulman: A Life in Clay" will feature work from throughout his long career. Schulman said recently, “I wanted to start all over again and get back to the essence. I've been working [with clay] for 50 years, and I've been constantly changing and developing, making one series after another. But I've always wanted to do what I'm doing right now…taking care of my own creative needs." Among the examples of Schulman’s constantly evolving style are his intricate double-walled vessels, salt-glazed porcelain pieces, and what he calls “three-dimensional paintings,” which are more sculptural works. Some of Schulman’s colorful inventions are the “Arlecchino,” or Harlequin, pieces. “I just consider them fantasies and daydreams,” he says of the three-dimensional paintings. Schulman, who was born in New York City in 1924, later attended Parsons School of Design there and later earned a Bachelor of Science degree in Art from New York University. In 1958, he received a Master of Fine Arts degree in Ceramic Design from the New York State College of Ceramics at Alfred University. Schulman taught ceramics classes at the Toledo Museum of Art, OH, and later became an instructor and the head of Ceramics and Glass at the Rhode Island School of Design, in Providence. He has been a Visiting Artist at the New York State College of Ceramics and at the State University of Iowa in Iowa City. 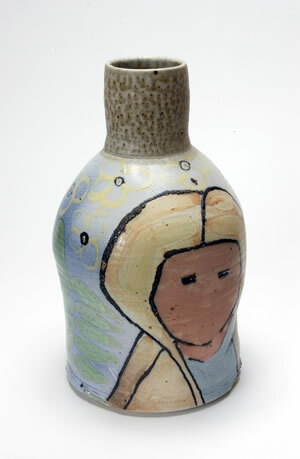 Between 1982 and 1984 Schulman was the Head of the Ceramics area at Ohio State University, in Columbus. For many, the fact that Schulman has been a teacher and a mentor to a variety of ceramists is of equal importance to his work. Schulman is highly regarded by his former students and coworkers. Jun Kaneko, who worked with Schulman at the Rhode Island School of Design, has said "It was an amazing experience for me to teach with Norm. We had very different approaches but got along really good. He is an amazing artist and has so much knowledge and always works. I think everything good about Norm." Since 1978, Schulman has operated Norman Schulman Studio in Penland, NC. His works have been included in numerous exhibitions, including those of the Mint Museum of Art, Charlotte; the Southeast Center for Contemporary Art, Winston-Salem and the North Carolina Museum of Art, Raleigh. His works are in the collections of the Smithsonian Institution, Washington, DC; the American Craft Museum, New York City; the New York State College of Ceramics at Alfred University; the Mint Museum of Art, Charlotte and the Asheville Art Museum. The exhibition, catalogue and tour of the exhibition are made possible by a generous grant from the Windgate Charitable Foundation’s Artist’s Exhibition Series. The Artist's Exhibition Series has been developed to encourage curators to look at the field of contemporary craft and determine which mid-career artists are producing the most innovative, interesting and expressive work. It is hoped that through these exhibitions and catalogues, curators will explore why the artist's work is important and provide much needed critical writing about the art being made. Additional support is provided by Ms. Cynthia Bringle, Dorothy and Clyde Collins, Mr. William P. Massey, Highwater Clays, Inc. and Odyssey Center for the Ceramic Arts. The catalogue of the exhibition, with an essay by Joan Falconer Byrd and an interview between Byrd and Schulman, will be available in the Museum Shop. This exhibition was organized by the Asheville Art Museum and Curated by Frank Thomson.